Senaat, one of the UAE’s largest industrial holding companies, has awarded an engineering, procurement & construction (EPC) con-tract to a consortium made up of SMS Group and Larsen & Toubro for building a new sour-grade pipe plant which expects to ship a substantial portion of its output to overseas markets including East Africa. Al Gharbia Pipe Company, a joint venture between Senaat (51 per cent) and two of Japan’s leading companies in the steel sector, JFE Steel Corporation and Marubeni-Itochu Steel Inc, is set to be the UAE’s first sour service capable, longitudinally welded steel pipe manufacturing plant. The EPC contract signing ceremony was held at Senaat’s headquarters at Etihad Towers. SMS Group and Larsen & Toubro will joint-ly be responsible for constructing the complete plant on a turn-key basis. 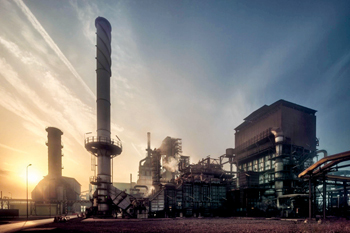 Located in the Khalifa Industrial Zone Abu Dhabi (Kizad) and with operations expected to formally launch in 2018, Al Gharbia Pipe Company’s production capacity is set to reach 240,000 tonnes annually, targeting the UAE market as well as neighbouring markets in the GCC and greater Middle East and East Africa. It will manufacture and sell large-diameter, high-quality, sour-grade Longitudinal-ly Submerged Arc Welded (LSAW) steel pipes that cater chiefly to the oil and gas sector. Material grades produced will be capable of minimising corrosion associated with sour environments, which are increasingly becoming the norm in the area’s gas exploration projects. Jamal Salem Al Dhaheri, Senaat’s acting CEO, reiterated the company’s efforts in identifying industrial investment opportunities and diversifying the country’s economy, during the signing ceremony. “Senaat plays a key role in creating projects that contribute to the country’s industrial diversification efforts. Al Gharbia Pipe Com-pany was born out of that ambition,” he said. “Ours and our partner’s vision for this project is driven by a growing global energy demand and will address the region’s increas-ing demand for world-class high-quality steel pipelines, increasingly sour oil and gas deposits and ever-more stringent product quality specifications, the demand of which is currently being satisfied through imported products from outside the region. “Our commitment to strengthening Abu Dhabi’s industrial sector is being put in place through the award of the EPC contract. Commencing work on Al Gharbia Pipe Company demonstrates further progress being made on supporting the implementation of Abu Dhabi›s Economic Vision and building the foundations necessary to manufacture industrial products that will reinforce the UAE’s position on the international map. 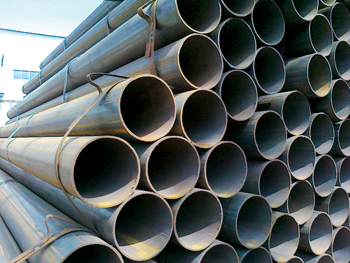 With a total investment close to Dh1.1 billion ($300 million), the new company will leverage JFE Steel’s know-how for high-quality large-diameter welded steel pipes, MISI’s sales networks and Senaat’s presence in Abu Dhabi, which is looking to drive the contribu-tion of the manufacturing sector in GDP up to 25 per cent by 2030. Earlier, Senaat announced that its Ebitda (earnings before interest, taxes, depreciation, and amortisation) during the first half of 2015 surpassed Dh1 billion, up 18 per cent from H1 2014, as it reiterated its commitment to execute future ambitious industrial pro-jects in the UAE within the four key industrial sectors defined by Abu Dhabi’s Economic Vision 2030, namely: metals, oil and gas services, construction and building materials, and food and beverages. Senaat’s revenues for the first half of this year were Dh6.8 billion, up 2.5 per cent from Dh6.6 billion in the same period last year. Net profit grew by 20 per cent to Dh453 million. Senaat has vowed to champion UAE industry and contribute to the nation’s diversification efforts by expanding its portfolio through global partnerships with leaders in their respective fields. The latest project not only meets a stringent demand at a time when being efficient in the oil and gas and other industries is more important than ever, but it is also symbolic of the strength and calibre of the relationships that it is able to forge. Senaat has an established track record in bringing international know-how to the UAE and building local companies that can compete globally and Al Gharbia attests to that, the company has said. Al Gharbia Pipe Company recently signed an agreement with Abu Dhabi Ports, the master developer, operator and manager of ports and industrial zones in the emirate, enabling it to proceed with arrangements to build the plant. “The exceptional infrastructure and transportation network offered by Kizad will make a significant difference to Al Gharbia’s business operations,” said Captain Mohamed Juma Al Shamisi, CEO of Abu Dhabi Ports. “The new facility will create business opportunities and jobs in the emirate, directly supporting Abu Dhabi’s vision of a diversified economy,” he added. Al Gharbia Pipe Company will utilise Kizad’s Modular Path, integrated with Abu Dhabi’s highway network, to enable the movement of large loads and structures to the city and throughout the rest of the emirate and region as a whole.